Lately we took two trips. We packed a sixpack of this excellent craft IPA each time. 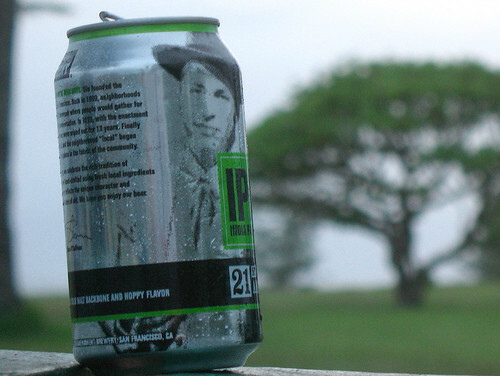 21st Amendment IPA is canned in San Francisco and can be bought out of the San Francisco brewpub. Yes, it’s canned. Several members of the American craft brewing community have exploited the fact that the light-weight and light-proof modern containers no longer add a metallic taste to beer. 21st is the San Francisco representative of this trend. The only issue we have with this canned IPA is that they don’t always have it in stock, and they may ration the sales to one sixpack per purchase. They also can a watermelon wheat beer for those who like a less bitter beach brew. First we packed it up, checked the luggage and took it to Kauai, Hawai’i, where a good India Pale Ale on the beach is a rare treat. (This tasty beer is photographed here at dusk near a pleasant beach. We were posing the cans all over the place like travel gnomes, including at this undisclosed picnic location.) There are two local breweries on this island, but we preferred our fine canned IPA to either local offering, or what we saw in the stores there. On the second jaunt we took a six pack of these cans to San Diego for a 3-day weekend. This may sound a little bit like lugging coals to Newcastle, since San Diego county is the undeclared IPA capital of the nation, but a can is a handy token of appreciation for fellow beer fans you may meet on the road in a place where there is plenty of great local IPA. The first surprise was to learn at the last minute that our old HQ for San Diego beer travel, the Liars Club on Pacific Beach had closed. A pity for many reasons, in part because we had reserved a hotel within walking distance along the beach. This meant we’d be driving more, and drinking a little less over the weekend. The good news was that Liars Club was opening in Alpine, the small town where the tiny Alpine Brewing Company makes their lovely IPAs and other fine beers. We’d never made it out there. On the itinerary! Driving was just going to have to be part of the plan after all. We decided to stop on the way at Alesmith, an amazing place which makes a whole series of huge and delicious beers. This is a great place to visit! It was convenient that we could split the samples, and that they’d do small sample pours anyway, since we still had two places to visit. Alpine Brewing is wonderfully small and casual. The brewmaster and his family were pouring tastes and cracking jokes with their customers. They had three terrific IPAs to try, along with some other styles. Another great experience. The new Liars Club is opening for real this coming weekend. We showed up during soft-launch, and it seemed very good and ready to go. The parking lot was full. People were happily eating and drinking. The brick and the dinner booths combine to give a homey Italian restaurant ambiance, a little different than the fine funky little old building by the beach! The familiar neon sign and the amazing taps behind the bar will make old fans of the Liars Club feel right at home. Looks like they’re back! The beer is actually now brewed and canned in Minnesota at Cold Spring Brewery.